I love giving gifts almost as much as I love receiving them. My favorite gift to give? Something personalized. Personalized gifts mean so much more to the recipient. It shows that you took the time and effort to create something. It also reminds you of them every time they look at it. My Parents both live 15 hours away from me and I rarely get to see them. By sending them gifts that have pictures of us it makes them able to see me more. Treat is a great website that has not only personalized cards (I send these cards all the time and people love them!) but also personalized gifts such as coffee mugs and desktop easels. I really love the easels because they look so much nicer than old fashioned picture frames. 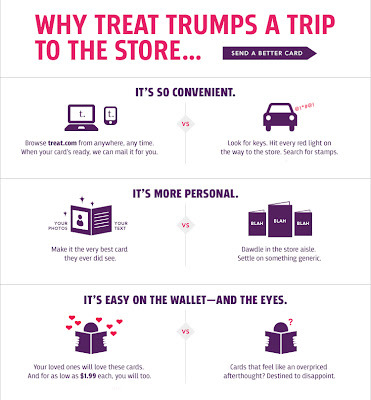 Treat is an easy and convenient way to order gifts and get them there quickly. You can have your Treat items sent directly to your lucky Recipient. Or you can have your items sent to you so that you can package them with other gifts or wrap them a special way. They also type out the addresses on the card envelope and will even include the stamp if you would like. Talk about making it easy! I also include a special "trademark" picture and saying on the back of the card where you can say "Made By...". Don't forget that Mother's Day is coming soon. Treat can help to make your Mom's day very special. One lucky reader will win a credit for 5 cards from Treat! Disclaimer: I will be receiving 5 free cards in exchange for this post. I was not compensated in any other way. All opinions and words are completely my own. I like the Smart Parenting card and I'd give it to my Mom for Mother's Day. Loving the "Whatever it Takes Card", as well as many others...they would be great for my mother and grandmother! I like the smart parenting card. My mom always let me lick the beaters :) I would give it to her for mother's day. I'd get the Doting Grandma card for my mother in law, let my daughter give it to her. She'd love it! I like the "Cheeky Comedy" (http://www.treat.com/product/43459/friendship_greeting_cards_cheeky_comedy.html). I'd send it to my friend, Lori - because she encourages my randomness and I love her for that!